You can also predict your fortune from Mole on your face, there are 21 spots on your face, and if you have mole on any of these spots, you can predict your future. Below is the 21 spot and their respected fortune prediction respectively. Aaj Astro uncle ke upay main hum janenge, chehre par til ho to us ka kya matlab hota hai. Astrology main us se kya bhavishyvani kar sakte hai. This mole is on the top of the center. This type of mole of the person's brain develops at a young age. This mole can also be on the line of nose between two eyes. This indicates that the body has had disease germs. This mole indicates that the disease germs are growing. By time if it is not checked, then the person will suffer from the disease at the age of 40-41. If mole is located on the tip of the nose it shows that at the age of 48 the person may have to face financial losses. This mole finds on Upper lip with the tip of the nose in the ditch. This indicates two things. B. Female person around 50-51 years of age in the life of an associate or by senior officers may be causing the problem. This mole is on the right side of the upper lip and lower lip is on the left side. This type of person gets to eat delicious food. This Mole is in the upper part of the lower lip right under the chin - can be left on both sides. This type of person has the ability to make quick decision. This mole is at the center of the upper part of the chin. This type of mole person who takes serious thinking at a young age. The mole can be in two places in the central part of the chin. This type of mole persons is harsh and aggressive nature. The mole can be right or left at the very bottom of the chin. This type of mole persons lives happy life alone in old age. The mole can be on the tip of the chin mole right in the heart - are left on both sides. These types of mole persons are lucky. They become successful with small hard work. 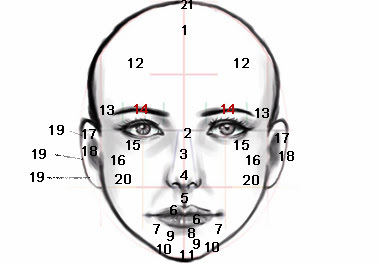 The mole can be right in the middle of the forehead - are left on the edges. These types of mole persons are lucky. They become successful with small hard work. The mole can be both external ears, eyebrows; ears are in line with the upper tip. These types of mole persons have depressed nature. Despite having achieved success in their life they are all sad. The mole can be in any part on two eyebrows. It is rich person. These are the mole under the eyes. Female mole on the left brow than she lives more than her husband. She spends widow life in old age. These are in line with Copal's ashes near the ear. If moles are on both sides then a person is a muscular person. If it is only one side then a person is failure. The mole on the upper ends of the outer circle of the ears is a bit lower. Some of the common sense wisdom of such a person grows larger than usual. The mole ears are in the middle of the length of the outer circle.This type of mole persons faces more difficulty in their life. The mole on the back side of the ear is the outer circle. If it is in the upper part of the ear, parents are estranged from, if it is in the middle part a person gets proper fruits of his work, if it is down side then there is loss of money. It is in the middle of the cheek mole. If a mole on the cheek then person dies from a remote location rather than his native land. If the mole on both cheeked a person remains happy in old age. It is in the heart of rounding the top of the skull. It is considered the best mole. It is so good for a person that poor parents being wealth but also the nonpareil - becomes the owner of the property.